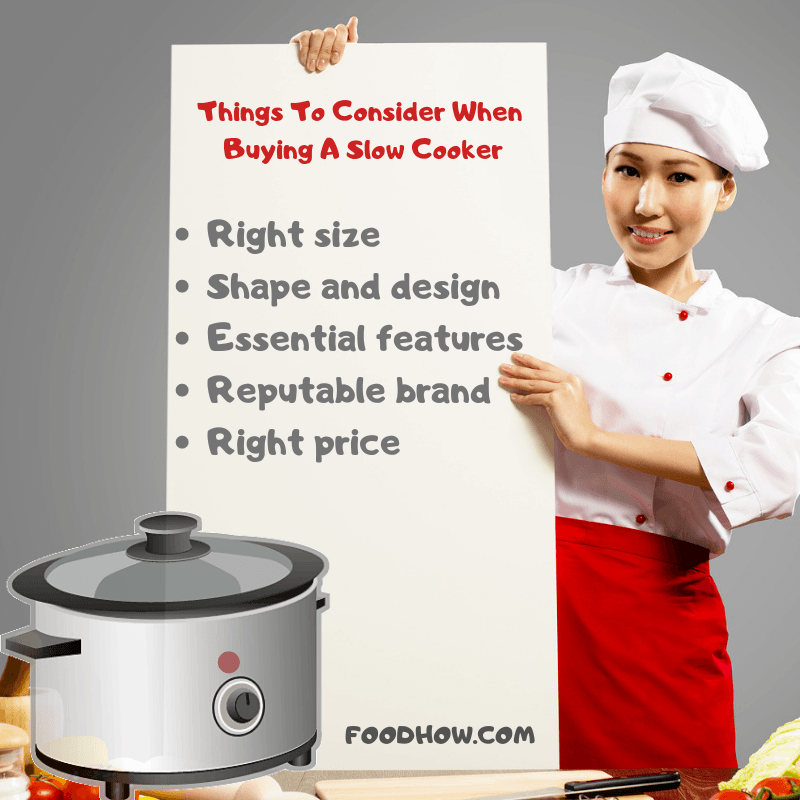 Choosing the right size slow cooker with the right features for your needs can be tricky, as there are many different sizes and so much variety these days it’s easy to get overwhelmed. This handy guide will help you pick the best and the right size slow cooker for any occasion, including links to some of the best models on the market. 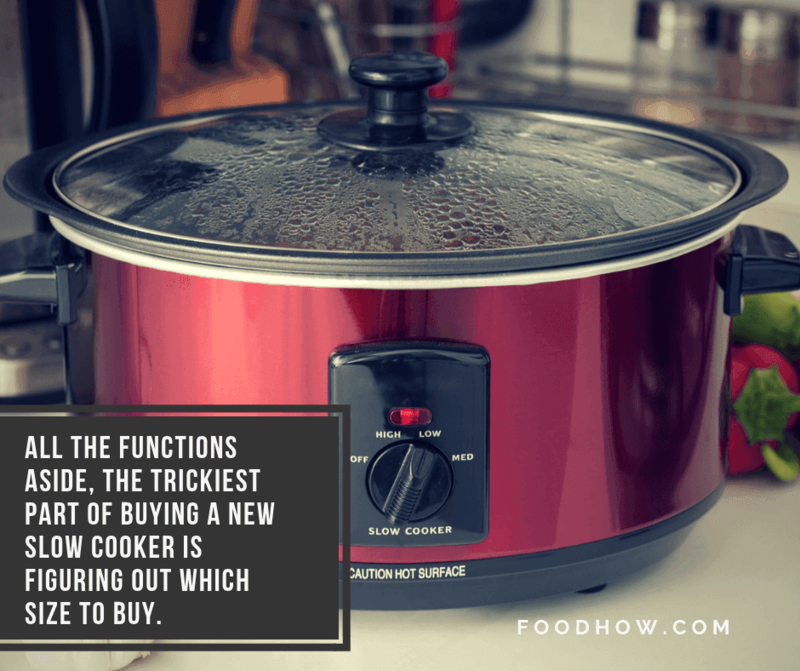 So, if you’re shopping for the best slow cooker, crock pot meal-maker, have a read through this guide before pulling the trigger, and you might save yourself lots of time, money and frustration. Why Get A Slow Cooker? Slow Cookers Save You Money! A versatile addition to your kitchen, a slow cooker is very unlikely to become one of those appliances you bring home and never really turn on. I use mine no less than 4 times a week. Once you have it, you will probably use your slow cooker very often, especially if you take some time to consider the needs of your household and pick an appropriate appliance. One of the must-have kitchen gadgets is a slow cooker, also known as a crock-pot. Still on a fence about purchasing a slow cooker? After all, you can just use the oven, right? Wrong – unless you love spending money on electricity! 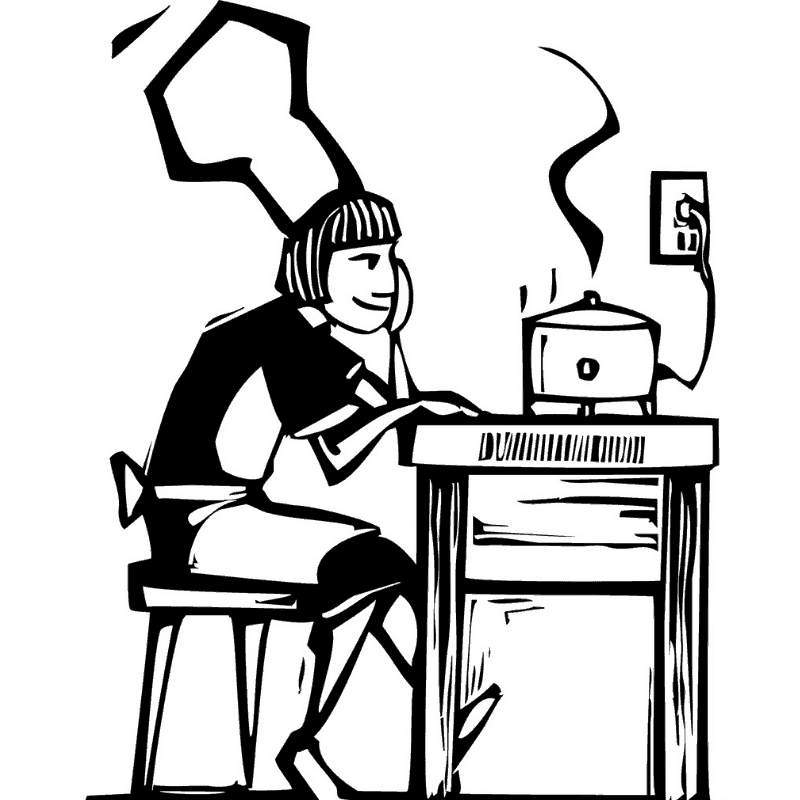 See, an oven-cooked meal can easily eat up to 3000 watts, whereas a small slow cooker will seldom go over 200, and not even for the entire time it’s on (once the pot is heated up to the desired temperature, it needs much less energy to maintain it). In addition, that little pot is the only thing that’s being heated, not the entire oven. Using a slow cooker for eight hours will equal about 15-20 minutes of oven cooking when it comes to electricity expenditure. In addition, due to the nature of the cooking process, a crock pot generally lets you get away with lower quality cuts of meat for the same excellent taste and texture, which warrants further savings. Even the least noble cuts become tender and juicy, making slow-cooked casseroles and stews absolutely delicious. Size – for one person, anything bigger than 3 quarts (3.4 litres) is likely to be a major overkill and anything smaller than 1.5 quarts ( 1.7 litres) will limit your options too much. For a large family, I recommend 6 Quart (6.8 L) and up. And if you want to cook a large chicken or even a whole turkey then below you will find some amazing slow cookers that are just perfect for the job. Shape – these days, slow cookers come in a variety of shapes, including round and even square. Now, this one is largely personal preference and depends on your kitchen layout, but generally, we find that oval shape is the most versatile, as well as easier to store and repair. Features – whilst it’s not necessary to go for the most expensive model, ideally you want at least one step up from the most affordable, entry-level appliance of a well-known brand. Features such as on/off light, timer and digital display make using the slow cooker so much more convenient, saving you lots of time and frustration. Basic functionality you'd expect from Crock-Pot. This may seem like a non-essential feature; however, I strongly recommend to only consider models that do have it! Unless you have a near-robotic routine and do everything at the same time every day, purchasing an appliance without an on/off light is calling for trouble. If you’re juggling many things simultaneously, the red light will remind you to turn the cooker on, and the “on” light will remind you that the appliance is hot and not to be touched without oven gloves. In addition, you’ll be able to monitor the process from across the room, meaning you won’t be glued to the kitchen whilst the dinner is simmering. 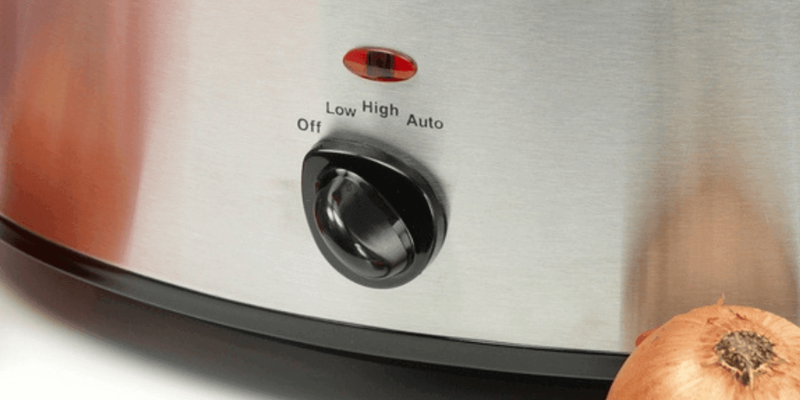 Another extremely handy feature that is now present in many entry-level slow cookers, the auto feature will keep the pot on high temperature for a set amount of time (typically one hour – but have a look at the manual of the model you’re intending to buy just in case it happens to be different), and then automatically switches to the low setting. This ensures much faster cooking time and requires much less supervision, which is kind of the point of buying a slow cooker anyway. This basic feature often found even in cheaper models, is an excellent way to keep the dish warm for prolonged periods of time. Essentially, after the slow cooker program has finished, this feature will keep the appliance on very low heat, ensuring the contents don’t cool down. If you generally eat food right after cooking it, however, this handy little feature may not be necessary. 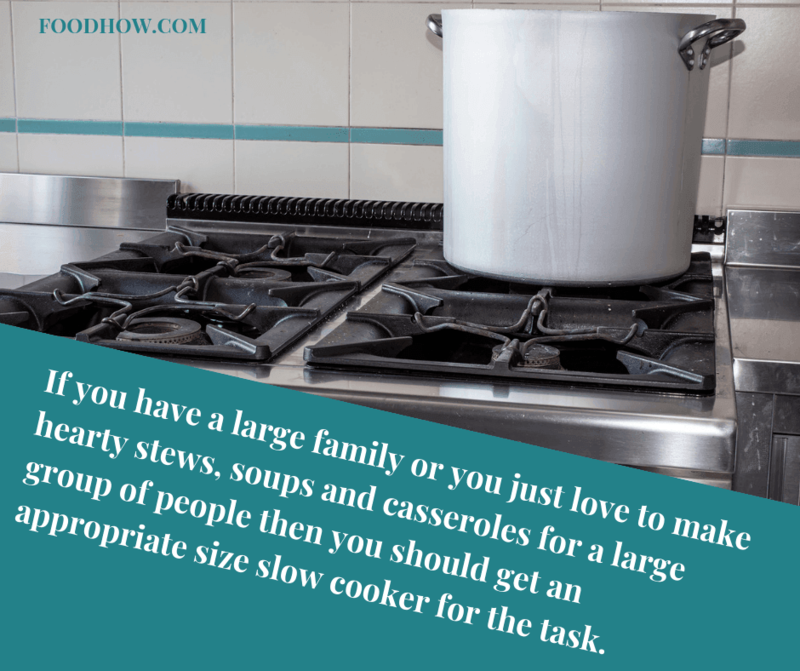 Cooking for a large group of people is entirely different from cooking for yourself, which should be taken into consideration when picking a slow cooker. As a single person, you probably have less kitchen space and a smaller freezer, which means there is no need to buy the world’s largest crock pot. Instead, look for a smaller model but if you like leftovers, have a large family or you'd like to slow cook a whole chicken or a turkey you need to consider getting one with the maximum capacity. But don't worry, below I will cover a wide range of sizes for every household’s individual needs. Ready to take a plunge? Below are my suggestions for the best slow cookers for a variety of needs. Bigger isn’t always better – those living alone or cooking dishes for themselves separately know this all too well. Picking a slow cooker is no exception: whilst in many other cases, it’s best to buy the most gigantic one that also has decent functionality (think families with many kids, community kitchens, or large shared households), cooking for one is a different story entirely. If you're cooking for just one person then buy a 1.5 - 3-quart slow cooker. However, much of the advice available out there ignores the specific challenges of cooking for one, which can be incredibly frustrating. I have put this guide together to help you choose the best one-person slow cooker to suit your needs – including examples and useful links. For a good balance between not cooking too much and cooking enough so you still have some leftovers for lunch, I would recommend a slow cooker that is between 1.5 quarts ( 1.7 litres) to 3 quarts (3.4 litres) and that is for one person. 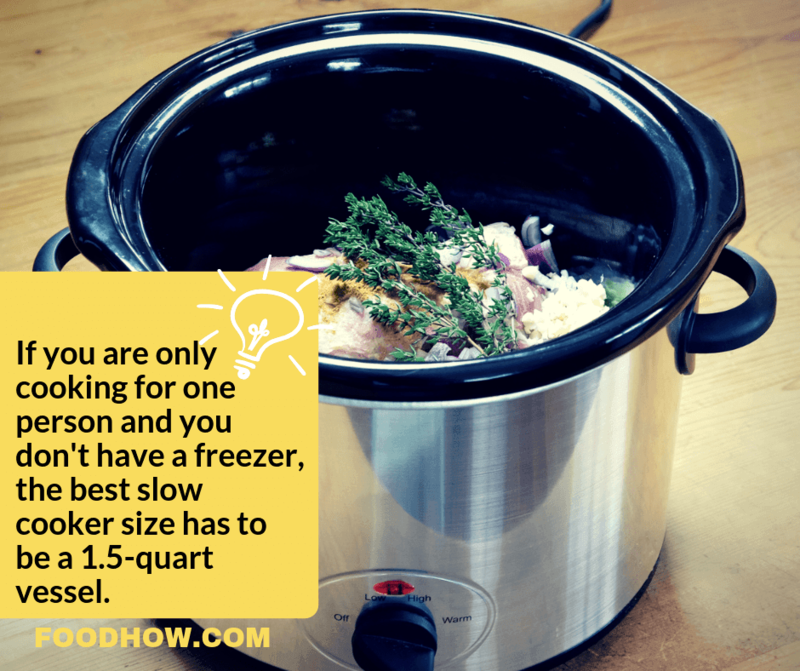 By default, 3 quart size crock pot is capable of making 4 meals at once, which is perfect to have a freshly made dinner and put the leftovers in the freezer without using up too much space. At the same time, it’s still a good size for a small group of guests, in case you need to whip up a dinner. Below, you will find my selection of some of the best slow cookers that are ideal for cooking a small meal. For your ultimate convenience, I have picked the models that were on top of my own final list when I was searching for a small slow cooker for myself. Ready to go crock pot shopping with me? Keep scrolling to find out more! Another fabulous 1.5 Quart slow cooker, this little guy is perfect for small batch meal prep or quick and easy entertainment. The lid comes with a rubber seal and a lid latch strap, so you can even travel with this slow cooker. From appetizers and dips to more serious dishes, this device is up to any task – and the Keep Warm setting ensures your creations will stay fresh and warm for as long as required without overcooking. This 2.5 Quart or 2.8 Litre casserole slow cooker features an unusual shallow shape, as it’s designed specifically for making the best casserole dishes you’ve ever tasted, sans the effort. There are 3 different temperature settings including Keep Warm, so the dish won’t go cold if the guests are running late. Removable lid and stoneware guarantee easy clean-up, leaving more time for the truly important things in life. Being on a slightly larger size than I would typically recommend for 1 person, this quality slow cooker is perfect for effortless meal prep. The insert and the lid are dishwasher safe, no scrubbing required. The design is truly luxurious – which is surprising considering the price – and features beautiful polished silver, black accents and sleek handles. With recipes included in the user manual, the possibilities are endless! When it comes to picking the best appliance for a family of 3-4 people, it’s important to consider your preferred dining style. 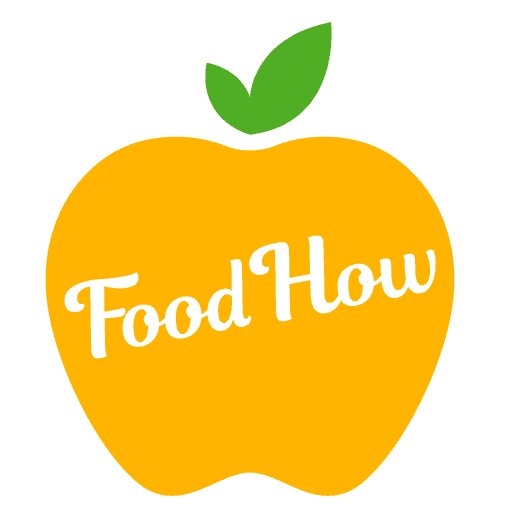 Do you typically eat freshly made dinners every day? If so, you may want to stick to a 4 Quart or 4.5 L appliance that will make easily 4 meals and won’t take up too much kitchen space. If you do tend to cook in larger batches, or perhaps want to always have some emergency leftovers handy, up-size and go for at least 6 L one. Well, this is not really your classic crock pot here but the reason I am mentioning it is that my Mum changed her old style crock pot for this one and she can't stop talking about it ever since. I don't think I would share her enthusiasm about it as I do prefer the simple, classic style slow cookers with a ceramic pot and a glass lid. But that said, it is one of the world’s best-selling slow cookers and this unique appliance combines 7 kitchen gadgets in one: Pressure Cooker, Slow Cooker, Rice Cooker, Steamer, Sauté, Yogurt Marker and Warmer. There are also 14 Smart Programs to pick from, streamlining your cooking: Soup, Meat/Stew, Bean/Chili, Poultry, Sauté/Simmer, Rice, Multigrain, Porridge, Steam, Slow Cook, Keep Warm, Yogurt, Manual, and Pressure Cook. For many dishes, it means you can start the process with a single press of a button, which is fabulous for busy lifestyles. With a bigger family, you really want to up-size. The same considerations apply – go smaller if you eat fresh every day and go big if you find having leftovers helpful. Below I have chosen 2 great large slow cookers that are both great for a large family. This programmable slow cooker features a touch-pad for maximum convenience, and programmable meals eliminate the need for watching or stirring. Of course, I don’t even have to mention the removable dishwasher-safe parts – instead, I’d like to point out that the device has a unique wraparound element to ensure even heating. When the cooking is over, the slow cooker automatically defaults to Keep Warm, so you can truly set it and forget it. Magic! Sometimes, when you say you don’t have any bench space, you mean it – and fortunately, there are mini slow cookers available that can easily fit into any space. Currently, the smallest appliances available are around 1 L capacity, which means such a slow cooker takes up about as much room as a kettle and is capable of preparing 1 meal at a time. Not all manufacturers offer tiny slow cookers as it’s quite a niche, however, there is still enough variety to pick from. But keep in mind, these cookers are really tiny. So if you really do need a super small cooker then these are great options for you but as these certainly, have their place. But if you are looking for a good slow cooker for one 1-2 people I suggest that you would pick one from the list of small slow cookers on top of the article. There is a fine line between buying an extra-large slow cooker for home use and “going industrial”, but generally no household would need an appliance bigger than 10 litres. This capacity will get you over 10 meals at a time, so may not be viable unless you have a very large family or a giant freezer to store the leftovers. Unless you are cooking on an industrial scale there is no need to get the largest slow cooker possible. For a family of 6-8 people, 7-10-quart size slow-cooker is sufficient. So if you do need a really big crock pot to feed a large number of people, make a big roast, cook a large chicken or even a whole turkey then check out these massive slow cookers below. 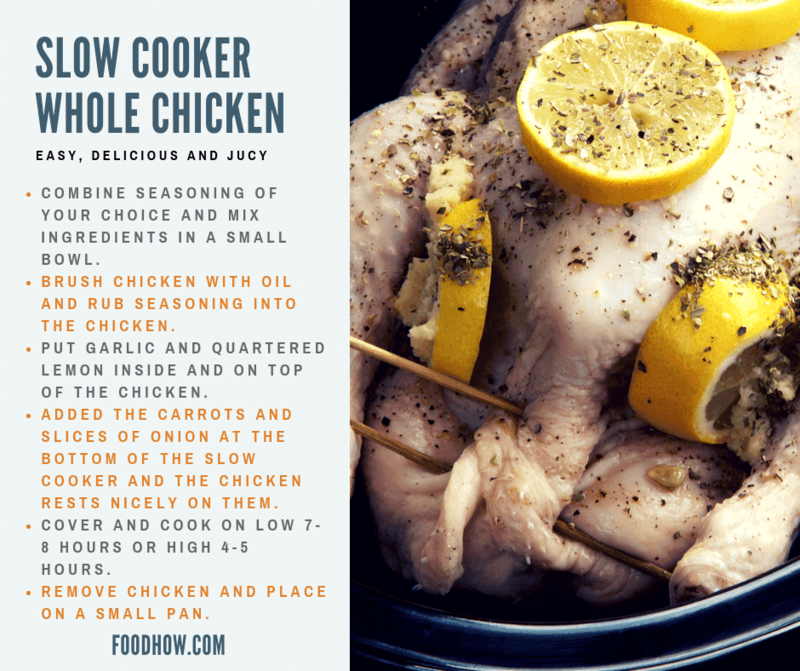 There are many fabulous whole chicken slow cooker recipes online, and if that’s something you fancy making, it’s important to purchase a large enough appliance. I suggest at least 6 L capacity to comfortably fit a whole chicken of any size – and there might even be room for potatoes. Pick any of the slow cookers above that fit those requirements and enjoy your whole chicken wonder. Yum! Cooking a whole chicken in a slow cooker is really easy and it will give you delicious, juicy and tender chicken. Here is how to cook a juicy turkey. Many cooks agree that slow cooked whole turkey is one of the most succulent meals ever created. However, turkey is a large bird – so you will need a reasonably large slow cooker to make such meals comfortably. I suggest going with a minimum of 7 L and above to fit the bird comfortably, and the oval shape is probably the easiest pick to accommodate a whole turkey. To cook a smaller size, 10-pound turkey, that will feed about 6-8 people, you need a slow cooker in a minimum size of 7 quarts. It is important to get an oval shape pot to fit turkey comfortably. Below are a few great options to choose from, specifically made for cooking a turkey, whatever the size. 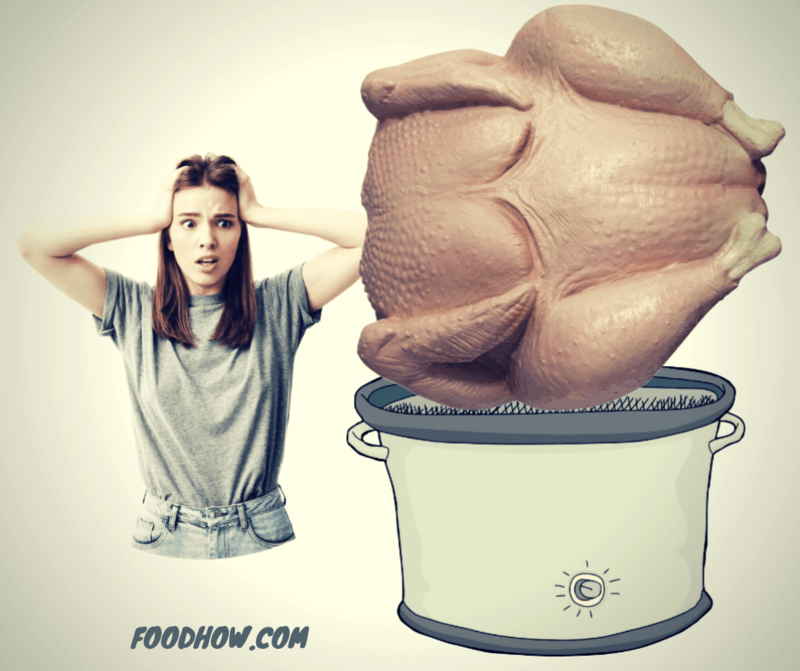 Now, If you are still wondering whether it is actually possible to cook a turkey in a crock pot or you have purchased a right size cooker for a turkey and now you want to know how it has done exactly then below is a great video that would outline the process in detail. There are some other techniques/recipes to cook a turkey in a slow cooker but this is one of my favourites. In the US, slow cooker sizes are mostly measured in quarts, however, In the UK, they are measured in litres. The terms "quarts" and "litres" when comparing crock pots and slow cooker sizes are almost identical so these are very similar in size indeed. 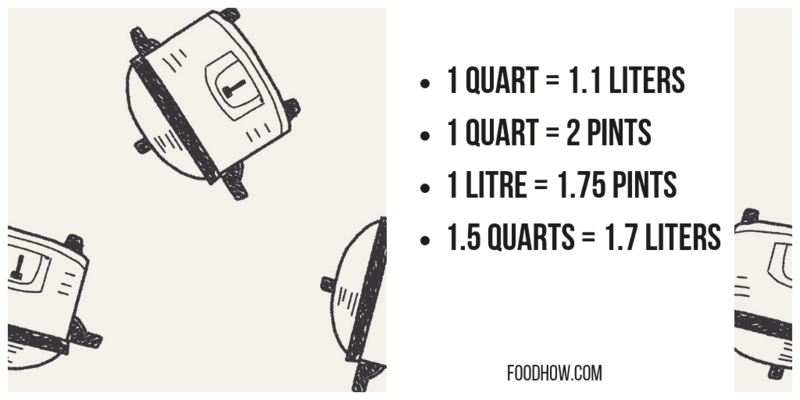 I’ve suggested above that 1.5 quarts ( 1.7 litres) to 3 quarts (3.4 litres) is a great size for a single-person slow cooker overall – however, there are a few additional considerations that may help shape your decision. For instance, if you have a spacious freezer, you may want to consider purchasing a bigger appliance to help you with meal prep. A single batch of slow-cooked meals can last a single person a good few days, stored in the freezer in quality containers. However, this is not the best option if you’re sharing the freezer space with other people – trust me, even if they’re not using it much at the moment, the second you fill it with your delicious meal prep they will suddenly need all that space. So, choose wisely and keep the household peaceful! Like many other things in life, picking a slow cooker isn’t going to be the same process for everyone. 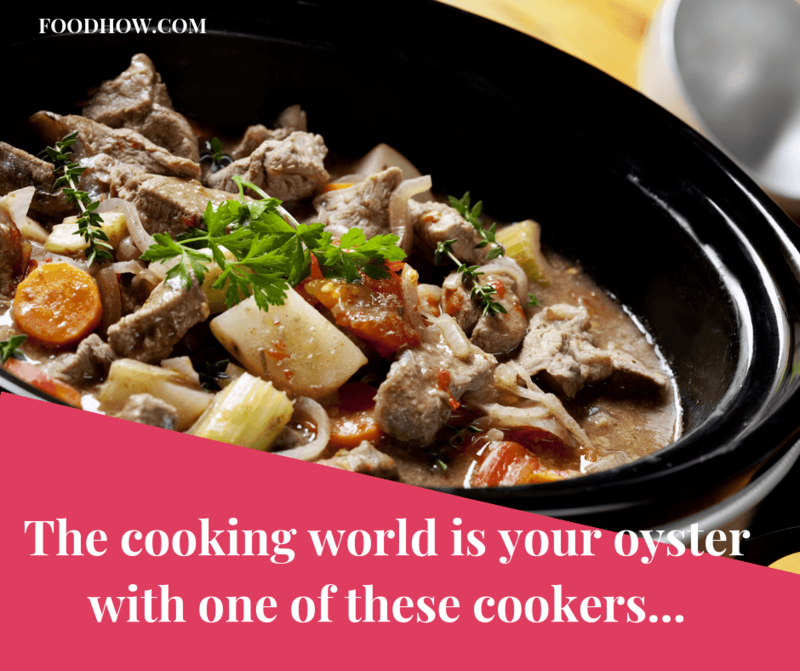 Whether you have lots of room in the kitchen, live in a tiny house, only cook for yourself or need to feed a family of 6 every day – there is a slow cooker for your needs out there, and I sincerely hope the guide above helps you find it. Have a look at the models linked above, do your own research and don’t be shy to ask plenty of questions in the comments below before the purchase. I hope you found this material helpful and would love to hear from you and help you make the best choice. Determine your budget and the size you need– and off you go, picking the most amazing slow cooker! Excellent review! I have a couple of different crock pots – I make game night dips in the little one since it’s just me and my roommate, and a medium sized one for meal prep type situations. I don’t have a family so I don’t really need one of the big crock pots, but I’m soooooo tempted to buy one so I can make a turkey! That seems like such a wonderful winter meal.